Is the constant drip, drip, dripping of a leaky faucet driving you crazy? 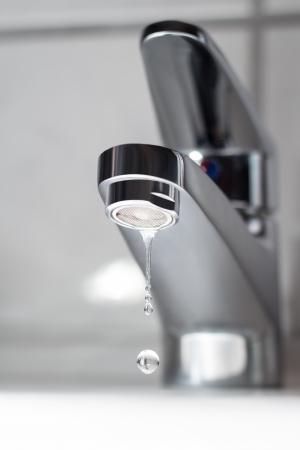 If the noise isn’t enough to prompt you to take action, consider this: even a minor faucet leak can waste up to three gallons of water per day. For the sake of your water bill and your sanity, fix that drip right away! Want to avoid a bill from your plumber? Repairing a leaky faucet is a relatively simple do-it-yourself fix. Here’s what to do! Turn off the cold and hot water supply valves underneath your sink. If you don’t have shut-off valves under the sink, turn off your main water valve. Turn the faucet on to allow the last bit of water to trickle out and drain the water lines. Examine the adjusting ring and cap. Does this area look like the source of your leak? If so, use your needle-nose pliers to tighten the adjusting ring. If that doesn’t solve the problem, you’ll need to replace your faucet’s seats and springs. Remove the adjusting ring. Next, unscrew the dome-shaped cap. To prevent damage and improve grip, place a cloth over the grip and unscrew using tongue-and-groove pliers. Avoid using too much pressure to prevent bending. Pull out the round metal stem, which will also remove the ball and the cam and packing. If this is where your faucet is leaking from, replace the cam and packing to resolve the problem. Look inside the valve. The small circular part you see is the seat, and the spring is located beneath the seat. Pry both seats out using your Allen wrench. Insert new seats and springs. Thread your Allen wrench through the flat side of the seat and through the narrow end of the spring, then tip the seat and spring into the hole. Do this for each set. Replace the ball assembly, cam, and packing. Screw the cap back on the valve using your hand. Use needle-nose pliers to replace the adjusting ring, then reinstall the handle. If these steps didn’t solve your problem, you may need help from a professional plumber. For the best faucet repair in Hagerstown, contact Larry & Sons today! Contact us online or call 301-733-5428.